We all talk about the physical effects of fibromyalgia, but not to be overlooked are the mental and emotional effects. It is very common for fibro sufferers to experience a heightened emotional response. I am not a doctor or specialist of any kind, so I can not explain why this is the case. But let’s be honest, doctors probably would not be able to explain it either. All I can tell you is the experiences that I have had and those of others I have talked to. Many do not realize how closely linked depression and anxiety are with fibromyalgia. I had one doctor tell me that when they have done studies on people with fibromyalgia, it is often hard to tell which came first, the depression or the fibro. It is easy to comprehend how fibromyalgia could cause depression. The constant pain and lack of sleep, not to mention the isolation that commonly follows, can really lead a person down a dark road. Anxiety is also common for fibro sufferers. That also makes sense, given the constant fear of when and where the next flare will occur. But anxiety about how others do, or will, treat you prevails. Will they believe that you really do not feel well enough to make it out? Or do they think you are just saying that because you don’t want to go, or have something better to do? Dealing with doctors can also lead to anxiety. Will this doctor believe me? Will this doctor be able to help me? Will they want to put me on a bunch of new medications? What will the side effects for any new medications be? 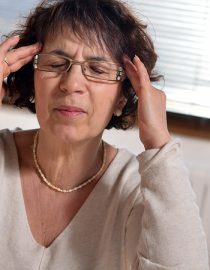 But there is also an increased emotional sensitivity that seems to be common for people with fibromyalgia. Something that you know should only be a slight upset becomes a huge tragedy. Even if your reaction makes no sense to you, you can’t control it. On the other side of that coin, you may experience a lack of emotional response. Something very sad happens, but you have no reaction. Other people are looking at you like you are a robot, but you are unable to express the emotions you know you should be feeling, the emotions you normally would feel. If you are like me, you may waver back and forth between these two extremes. One day you are sobbing over a slightly emotional TV commercial. The next day you have no reaction to your pet dying. Those are some pretty big extremes right? Well I’m going to blame the fibromyalgia. And I’m not alone – other sufferers have experienced similar emotional instability. Could it be that fibromyalgia affects our brains and emotional response center just as it affects our pain response center? It is possible. But as I said, I am no expert. What I can tell you is that these feelings, or lack thereof, are probably not going away anytime soon. Well is there any positive news? I have found a few things to be helpful. When I first started having these fluctuations in my emotions, I felt frustrated with myself. I am not the kind of person that is ruled by emotion, but I’m not heartless either. And I would try to convince myself that what I was feeling was wrong. I also tried to hide these emotions, thinking everyone else would think I was crazy. I thought I was crazy, so why wouldn’t they? But I now know that not only did that not help, it made things worse. I have to accept that I don’t always react appropriately for the situation, and I simply cannot help that. I have also found that it is vital to have a few people that I can talk to, people that I can be completely open with. I know they will listen and not judge me. Talking to them can be a huge weight off my chest. This may not always be possible, but let’s consider a possible scenario. You are having an overly emotional day, and someone invites you over to watch that really sappy chick flick that always makes you cry. Maybe today isn’t the best day for that. Another scenario – if you have been wanting to confront someone about an issue, wait for a day when you feel a little more emotionally stable before talking with them. Or if it’s something that can’t wait, make notes of everything you want to cover. That way if you do get emotional and get off track, you will still be able to cover everything that you needed to. Even if everyone does not fully understand what you are going through, talking it over with them may help them be a little more patient with you. It may also help avoid hurt feelings if you are experiencing a lack of emotions to a situation that is emotionally charged for them. I wish I could say that there is an easy fix for the emotional roller coaster we fibromyalgia sufferers seem to be on. But as with many other aspects of this illness we simply have to learn how to cope the best we can. It may not be an easy path, but we have survived much worse. Next articleFibromyalgia and Alcohol: Is It Safe?